So what do you do when your friend has a new book out? Well you do the ‘Happy Dance’ with them and of course get your hands on a copy as soon as you can! I knew Dawn’s book was going to be great because I’ve had the privilege of actually taking her ‘Doodle Soup’ workshop from her in person and if anyone can teach your to doodle, she can! I’m very excited to help her kick off this blog hop and if you continue along you will have a chance to win a copy of this yummy book for yourself! Dawn actually facilitates your inner doodle girl to come out and play. 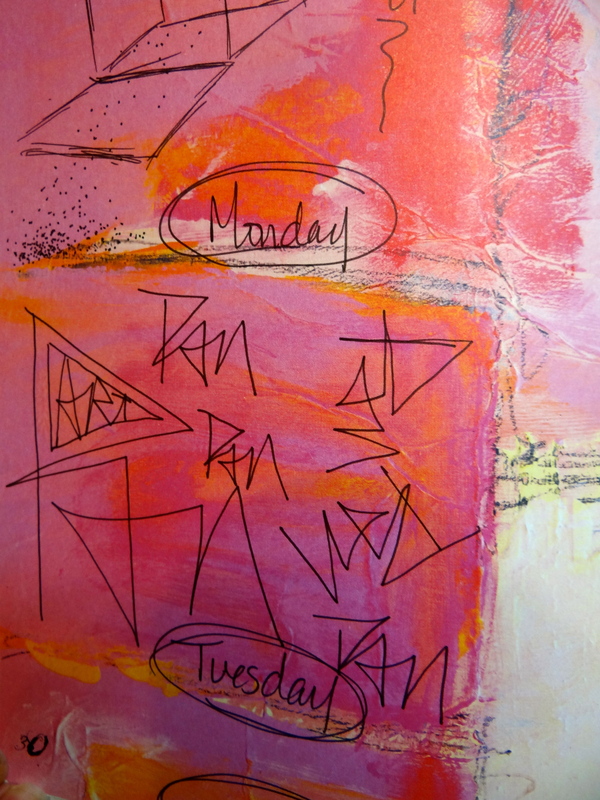 With prompts, both with words and visual stimulation, she guides you to rediscovering the love of doodling. I used to doodle. In school, on my Pee Chee, or notes to friends written while I was supposed to be paying attention in class, I doodled up a storm, but life has a way of taking the doodle out of you sometimes. At least doodling with intent-for the sheer pleasure of it. 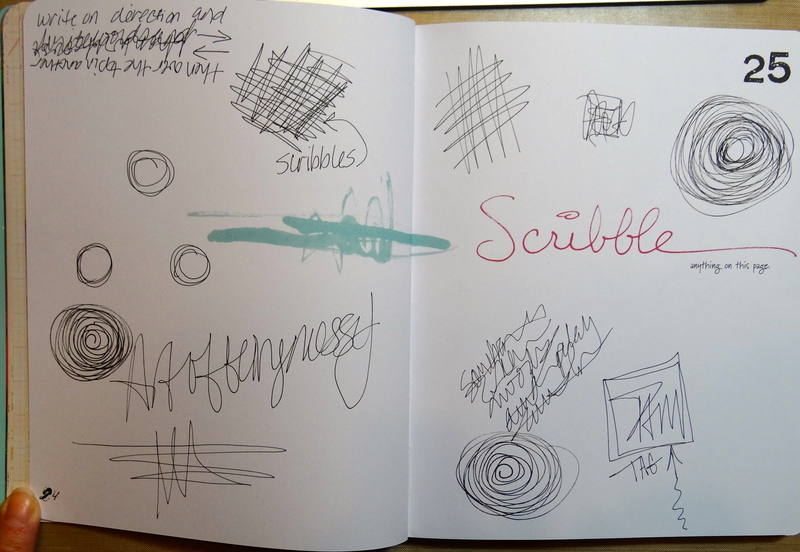 I’ve discovered a few things on my journey into this book-I’m not very good at scribbling. I found it hard to do. I’m hoping by the end of this book I will have loosened up and overcome my scribbling inhibition. I’ve also discovered that marking in a book is sinfully delicious, after you get over the fear of making some kind of ‘fatal error’. I decided that my book is for me, and though I’m sharing a few pages here, I’m not going to share the rest. My marks will be made with the soul intent for inner growth. I’m only using pen and if I make unattractive marks, then so be it. I’ll get better, we always do with practice. The backgrounds are already there, waiting for the doodles, so this book is awesome to put in your purse and take out whenever you have a few spare minutes. My dedicated ‘doodle time’ is at my sons music lesson. The book is a great size that fits nicely in my purse, the pages are a nice heavy weight, and all I need to take is a pen! While this book would be perfect for someone to cross into the world of Art Journaling, it’s also great for those of us who already journal too. 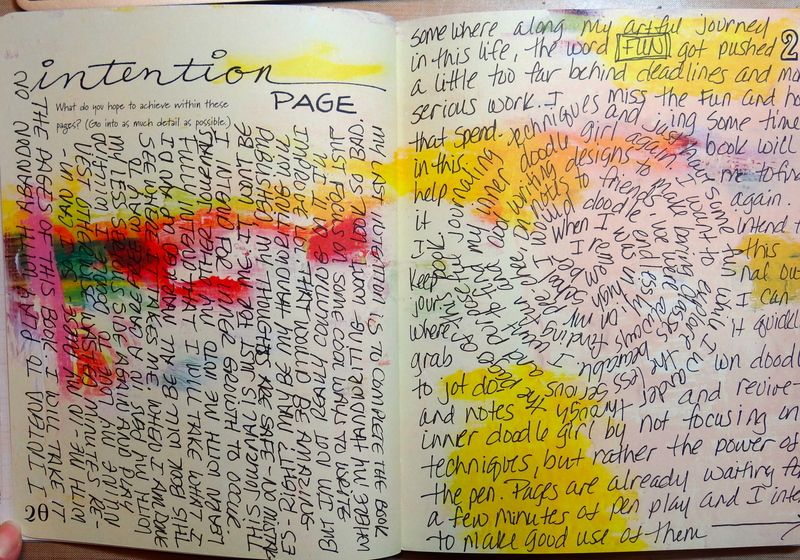 Sometimes we just don’t have enough time to get into the messy stuff and this book can store ideas for future pages as well as help you to take a break while still feeding the journaling habit, and it can also get out of a journal rut if you’re in one. It’s full of inspirational starts that could spark a whole new direction in your work. When I’m done with this book, it will not go on my bookshelves with other ‘how to’ books, rather it will go along-side my other art journals, to be used as a tool for ideas in the future. the drawing will be February 14th. Pam, I’m so happy to see that you are so supportive of your friend’s book. I’d love to get one myself. Your page with the faces is just beautiful! The book looks like fun…doodling doesn’t come naturally to me, but I’ve “worked at it” over the past year or so, and it is definitely worth the effort to push myself to do it. I looked for your collage medium and it is out of stock, dissappointed! Any idea when it will be in stock again? Pam, What a great review…I ordered it right away. Looking forward to getting it. Thanks. Doodling does not come naturally to me at all. The only thing I can recall ever doodling as a child, was squares for cubes, not very exciting or creative. This book might just be what I need to free me from the world of being blocked in squares. Looking at such talent in all the blogs is prize enough! The book looks amazing too and I would be so excited if it became mine. I’ve never done a blog hop. Is it just a matter of visiting each of these blogs on the designated date? Looks like a fun book and a great prize. I am working on a project that will eventually require doodling in stitch. You just make me want the book all the more!! What fun ! Kimbo wanna doodle all day ! 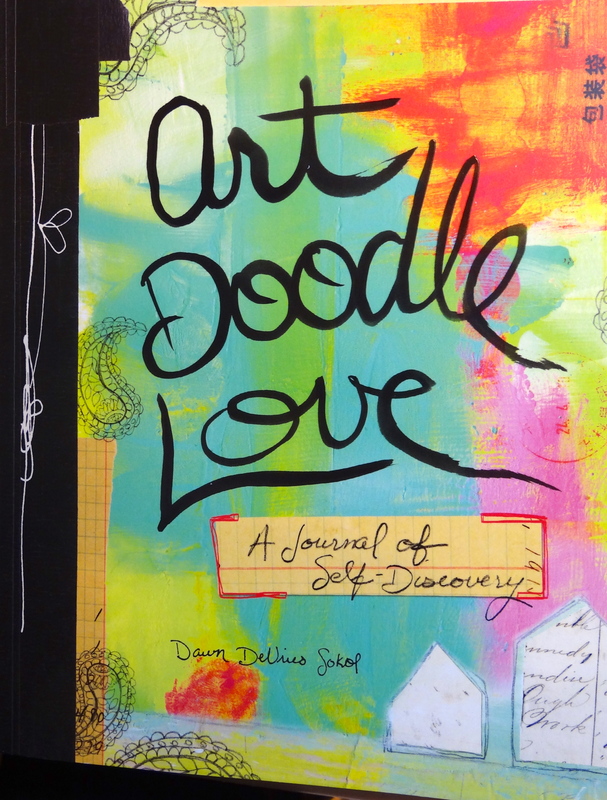 The more I see and read about Art Doodle Love, the more I, well, love it. I like the way you’re using it just for you, cool stuff. I know it sounds like an odd question, but what pen (if just one) are you using on those pages – it looks like such a good doodling pen, and as an avid doodler, I’m always on the look out for the next best pen! Thanks. the pages you did were great. cant wait to get this book! Ideas are tumbling over each other to get outta my head, could this be the helping hand I have been searching for to get it on the page? I will need to get this book! Looks great and very useful. I love to doodle, but I too need practice. Thank you for sharing and for the chance to win this book! Looking forward to seeing the rest of the hop. Love your work Pam, you are so inspiring! Take care. Recovering from a week of illness and wish I had such a book right now! I am a great lover of Zentangling for two years now. I am always inspired and curious when a new doodle book emerges. I hope a chance to win this one. Love how you drew portraits amidst the paint drips. That was the first page that “drew” me in to doodle. Great set, and great fun! Pam – the link to Dawns blog doesnt work! This sounds wonderful! There are days when I go from place to place without stopping. 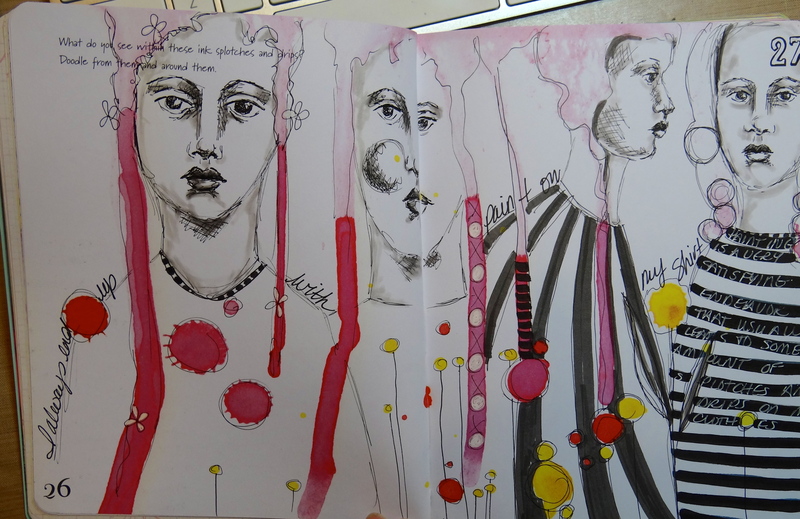 I always bring a sketchbook, but a doodle book would be fun to use. Thank you for this opportunity! I love how artists support other artists…have a great day! Just what I need to get my creativity into second gear! Wow, that looks like a nice book. I hope we can get a copy of it in the Netherlands as well. My boys are swimmers, so I can take it wth me on the training days, 3 timesa week and on the matches, almost everey saterday. I just love what you do with it alteady.